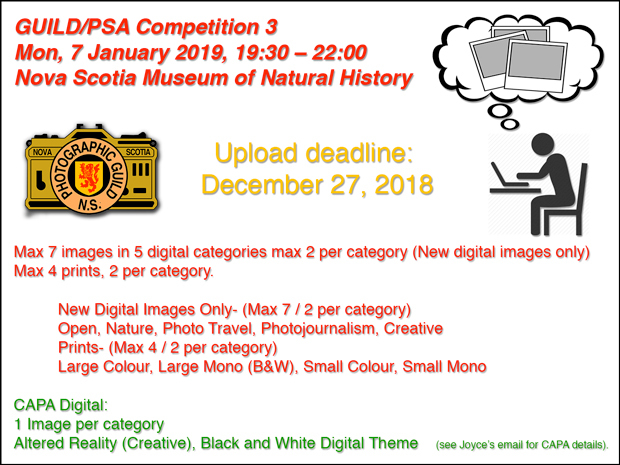 Due to a scheduling conflict for use of the museum’s auditorium, competition 3 judging will be held Sunday, January 6, 7:30 PM, in the auditorium. We will NOT be having any meeting on Monday night. 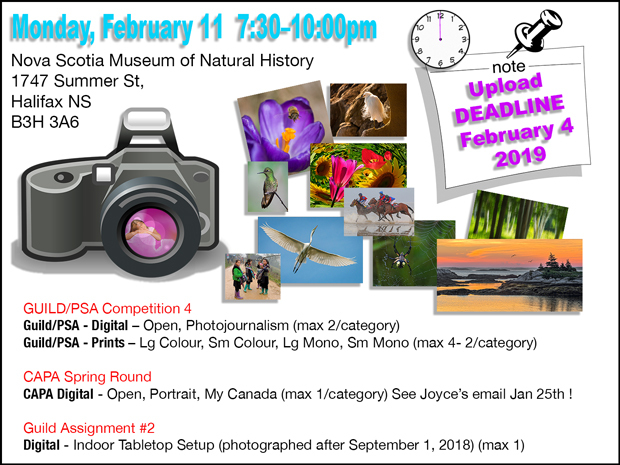 This entry was posted in 2018, CAPA, Competitons, Guild, PSA on January 3, 2019 by Darryl Robertson. If you are like me you are shaking your head and wondering how we are at Competition 3 already…The 27th is the deadline for uploading…so with all the things going on in the next week, I will be so bold as to suggest you start your images for this competition, and get started right away with the upload process! As usual if you have questions you can email any of the executive listed on the PGNS website or reply to this GoogleGroup email….Again, I wish you a Very Merry Christmas….and a wonderful New Year ! ‘2019′, here we come! This entry was posted in 2018, CAPA, Competitons, Guild, PSA on December 20, 2018 by Darryl Robertson.